This is a source book, and a great source book containing as it does the despatches from the field mentioned above. Additionally, as part of the inclusion there are some great photos taken of various air attacks by different units relevant to the despatches themselves. Reading the despatches, Air Vice-Marshal Stevenson’s despatches were particularly interesting, highlighting the qualitative difference his 53 aircraft had over the 450-500 Japanese aircraft but also highlighting the difficulties he had with no effective early warning system leading to the risk to his Hurricanes and P-40s. Air Chief Marshal Peirse’s despatches reflect the position he found himself in where unlike Stevenson’s small, outnumbered airforce, Peirse had 48 RAF and 17 USAAF squadrons under command against a Japanese air force of some 250 aircraft. Peirse also had upgraded aircraft with his Spitfire’s enjoying an 8 to 1 superiority in kills. Stevenson goes on to relate other aircraft movements, the defence of key areas and the airfields and so on. There is a wealth of detail in not just the first despatch here but in the four in this book. This is an interesting book, and I am looking forward to getting my hands on others from the Despatches from the Front Series. I recommend this book to the military historian, general reader with an interest in the Second World War in Indochina and Burma, and the wargamer building scenarios from this theatre! The book is available in Hardback, ePub and Kindle formats. I have been testing a new (for me) painting technique of brown undercoat, block (ish) paint and wash. 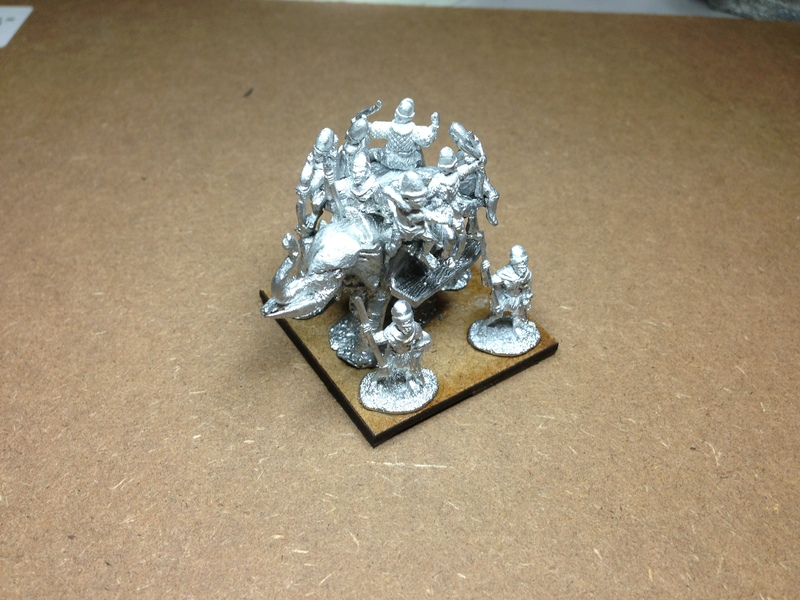 This is a method I am planning to use on my South-east Asian themed armies. At the moment they are Burmese and Khmer. I wanted a quick test to start with so an element that I could paint simply. I selected the Maiden Guard from the Khmer, for no other reason than the colours and that there is a lot of flesh. These figures are 15mm tall so the detail that looks overdone in these photos is not so bad in real life, although I will need to redo the faces of the figures again. 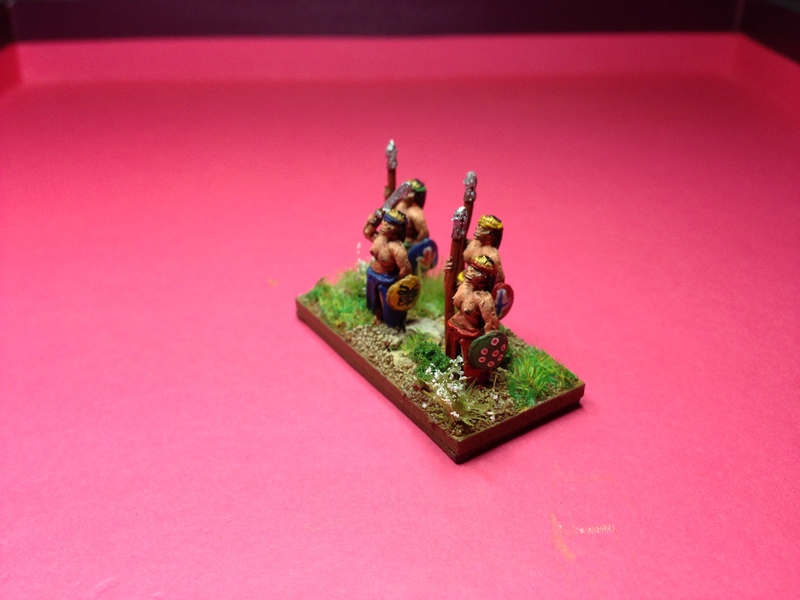 These are Irregular Miniatures and I am pleased with the way they look painted. Much nicer than their appearance in bare metal. Thinking about the 1/2400th scale Guerra del Pacífico vessels I have for Peru and Chile. It was an interesting sea war. Somewhere in the stockpile I have some 10mm Chilean and Bolivian figures for the land warfare component. Mind you, in a recent mini-sort of the Man Cave I have not managed to find any evidence of those figures yet. They must be in there somewhere. I think, however, in a break from nautical painting, I may just try get the Burmese, or the Khmer, or both DBA Armies painted. The figures have been cleaned up and based. 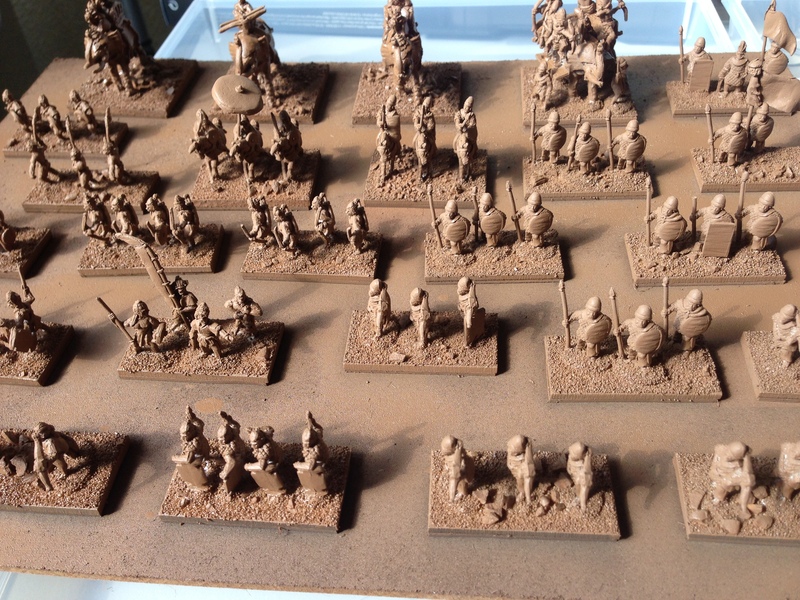 They have also received a brown undercoat in Army Painter spray paint so they are ready to go. 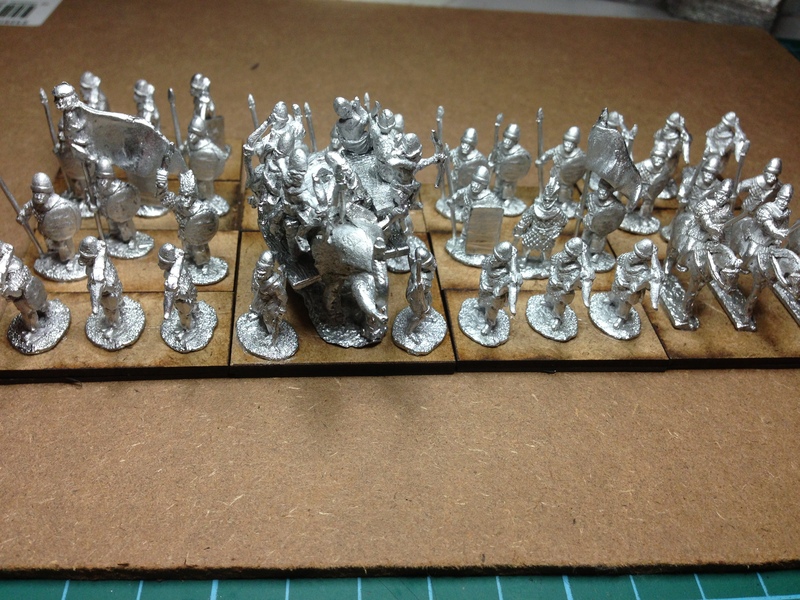 I will admit being interested to see how these look after painting as it will be the first time I have painted Irregular Miniatures 15mm figures. As today is Friday and as we approach beer o’clock, I guess this is tonight’s rumination over a quiet pint. After the excruciating effort of super gluing all the figures to Irregular Miniatures Burmese elephant – not to mention several successful attempts at gluing my fingers together ((and the ensuing problems the next couple of days at the office when the finger-print reader at the door no longer recognises my fingerprint)) – I was ready to start the next step – gluing the basing material on and undercoating. First however, there was one more &$*&@#£ archer to glue back on that &$*&@#£ elephant. And yes, that is the &$*&@#£ Burmese elephant on the right hand side of the pachyderms! I had ordered some Burmese – enough for one DBA army both as an opponent for the Khmer and because I needed to purchase 4 Khmer crossbowmen. 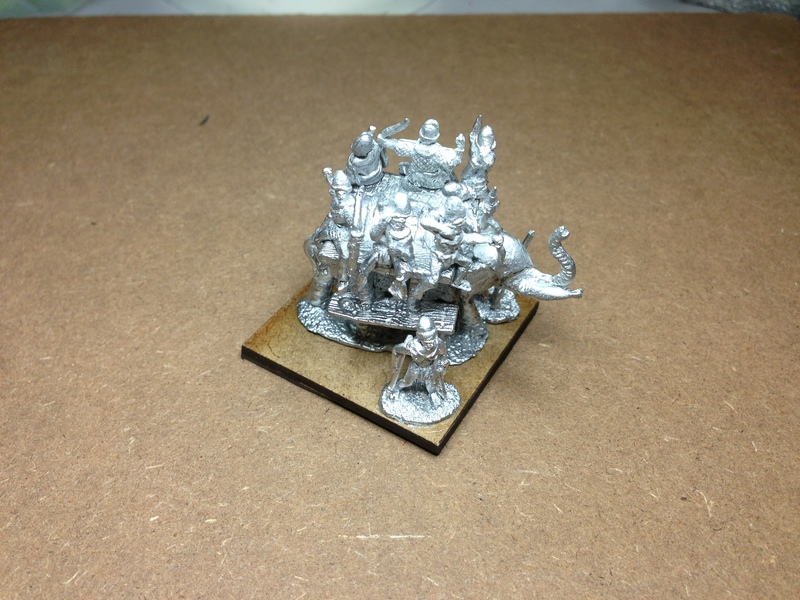 I didn’t feel like sending an order to Ian Kay at Irregular Miniatures for four figures so he ended up getting the order for the Burmese. I reckon when I get around to the Indonesians and Malay I’ll be on to Grumpy’s figures. The figures arrived very quickly from Irregular, taking about 7 days from order to delivery. In fact they arrived a few days sooner than I expected. 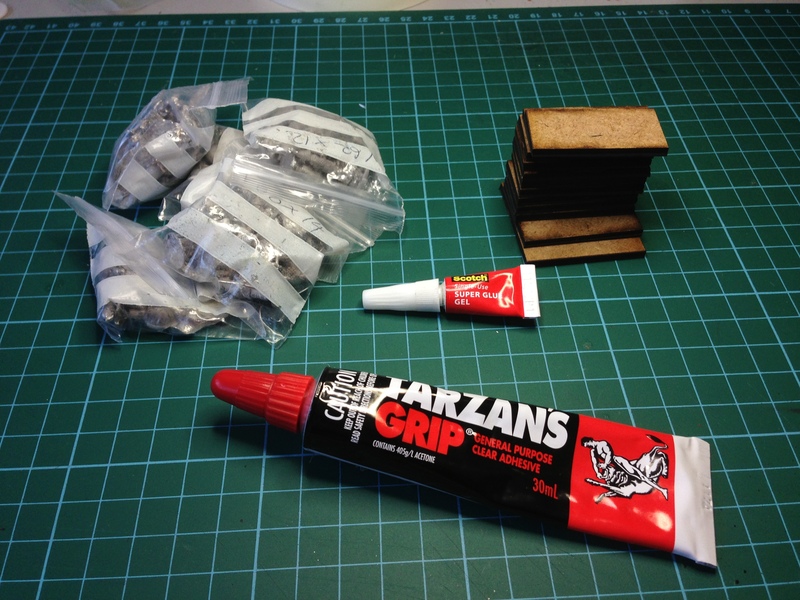 I put the magnetic material on the bottom of the MDF bases before starting on the figures. I set to work with file and X-acto knife on the figures, cleaning the flash. Some of the figures had a fair bit of flash but it was fairly easy to clean off. Irregular seems to use a softer metal than some other manufacturers. Once the flash was cleaned off the figures were attached to bases ready for the flocking to come. There was no need to trim bases in this batch like I had to with the Khmer as there are no real close order troops in the Burmese army. The elephant is a beast however. I have managed to delete my fingerprints again – I guess I’ll be using my plan B key at the office to get in tomorrow morning as the fingerprint reader is not going to be able to read me. There are so many crew for the elephant – in fact two of them fell off just after the photos were taken. I’ve decided to leave them off tonight and will attempt to glue them on tomorrow night after all the other glued on blokes have had a chance to let the glue cure. I decided to finish off this blog post with a couple if pictures of the elephant to give you an idea of how much of a beast it is. It’s been a few months since I outlined my next wargaming project, to be added to the pile of other projects either planned or underway but not yet completed. Time for an ancient one. This came about as a result of the three for two sale from Essex Miniatures. I’d bought Hungarians, Poles and Serbs. It felt so good handling 15mm lead again that I thought I should look at something a little Ancient. Having been reading Conn Iggulden’s Mongol series of books recently and noting that the fourth book in the tale of the Mongols has just been released, it felt good to consider a Mongol theme. The DBA rules have a Mongol campaign in them with the armies being Hungarian, Mongol, Pole, Russian, Chinese and Khwarizm. There is also an eastern based campaign set around the Asian opponents of Kublai Khan (Korea, Sung Chinese, Japan, Vietnam and Burma). These would do for starters. I know that I could easily add the Tang and Sung Chinese into this group, especially as they are dealt with in the first three books of Iggulden’s novels but I think they will keep nicely for a link set. I realise that I could then add in the period of the various Hordes traipsing across Asia in particular but they will need to wait for a later project. In the meantime, there are 16 DBA Armies listed above – that will keep this as a running project for some time. The next stage in planning this will be identifying figures, starting with the Early Mongol period. 244,146 hits. Note that I had 258,644 hits on the Hole before moving here.